Ben and I are totally flipping out over Apple Tarte Tatin (aka Upside Down Caramelized Apple Tart). I bellowed, “YUUUUUUMMM” with every spoonful. Ben rumbled, “SOO GUUUD” eight times per minute. It should have been embarrassing, but we were far too captivated by the taste-magic to notice. I make a lot of desserts. Most of them are good. This one was fabulous. I’d like to say we couldn’t stop eating it, but we had to—we demolished the entire plate in less than 24 hours. The wonder that stole our taste buds, our self-control, and our ability to form complete sentences? 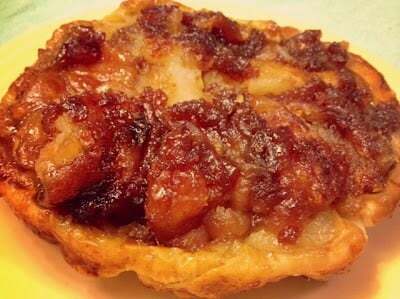 APPLE TARTE TATIN. Tarte Tatin is a traditional French apple dessert that (legend has it) was born of kitchen “disaster.” Around 1880 at the Hotel Tatin in Lamotte-Beuvron, France, owner and chef Stéphanie Tatin started to make a traditional apple pie but left the apples caramelizing in a saucepan too long. To rescue the pie, she placed a pastry dough over the whole pan of apples, finished it in the oven, then flipped the tart and served it upside down. Any dish that begins like this could not possibly be a mistake. The hotel guests must have shared Ben and I’s fervor, because 130 years later, tarte Tatin is still rockin’. It is similar to apple pie but more pure, more true, and more…apple-y. Where apple pie is often all about the crust, tarte Tatin is all about the apples, always. Imagine a perfectly balanced, caramelized layer of hot apple glory, nesting in a golden pastry crust. Now multiply the yum-factor of that sentence by one million or so. That’s tarte Tatin. Hot caramel, ready to be tranformed. Our apples were especially good because (life update!) I MADE A FRIEND! My new pal Amanda, her adorable nugget of a daughter Katelyn, and I visited a local orchard, so the apples were the definition of fresh. I was most excited about the orchard’s cider doughnuts and apple baking possibilities. Ten-month-old Katelyn was most excited about its family of chickens. Everyone left happy. Freshly picked apples, ready to be transformed into a caramelized miracle. My selection of tarte Tatin for the apples’ ultimate destiny stemmed from my newest adventure: French class! In an attempt to resurrect my languishing skills, I enrolled in a non-credit conversation course. It’s once per week, includes dinner (avec du vin, naturellement), and leaves me craving all things françaises. Whatever language you speak (or used to speak), you must taste TARTE TATIN. You deserve it. I can think of no better way for to celebrate fall’s cherished apple crop than with this special dessert. Bon appétit! If only all baking “disasters” could be this fortunate. Apple Tarte Tatin is one of the most fantastic fall desserts you can try. This recipe is adapted from Julia Child. Peel, halve and core apples. Once cored, cut lengthwise into quarters (you will have four pieces total per apple). Make a small, shallow cut (a bevel) on the outer (curved) edge of each piece to create a little flat surface. The apple will be resting on this side, and the cut will help it stay put (for a visual, click here). Toss apple chunks with the lemon juice and 1/3 c. of the sugar and set aside for 15 minutes. This step brings out the apples’ juices, which thickens the caramel. Melt butter in a sturdy, 9-inch ovenproof skillet over medium heat. Sprinkle in remaining 1 c. sugar and whisk it over the heat until it becomes the palest of caramels. Remove skillet from heat. Still off the heat, add the apples to the skillet, arranging them rounded sides down in one layer. Lay any remaining apple wedges in a second layer, rounded sides down, starting from the center. Return the pan to the stove and cook in the caramel for another 20 to 25 minutes over moderately high heat. With a spoon, regularly press down on the apples and baste them caramel juices from the pan. Don’t be afraid to move and swap the apples’ places if it seems some are cooking faster than others. The apples will shrink during cooking, so if your second layer of apples slips into the first, this is fine. Preheat oven to 400 °F. Roll your puffed pastry to a 9-inch circle and cut four vents. Remove skillet from heat, and arrange pastry round over apples. Tuck any excess in around the apples to create a nice edge. Bake until the pastry is puffed and golden brown, about 20 minutes. Once baked, use potholders to place a plate or serving dish that is larger than the skillet over the pasty. Quickly unmold the pan, flipping the pastry and apples at once onto the plate. If any apples remain behind in the pan, nudge them out with a spatula and place them on top. Serve with ice cream, lightly sweetened whipped cream, or my personal choice: vanilla coffee creamer. Eat immediately and pat yourself on the back. While you can use any crust for tarte Tatin, I adore it with puff pastry. The flakey texture pairs perfectly with the caramelized apples. While I’m usually all for preparing crust from scratch, the Pepperidge Farm puff pastry I picked up from the grocery store nailed it. The time savings and simplicity were a nice bonus too! This recipe calls for a 9-inch ovenproof skillet. If you don’t have an ovenproof skillet, just cook the apples on the stove and transfer them to a 9-inch round baking dish (along with their caramel), then top with the pastry and bake as directed If like me, your ovenproof skillet isn't 9 inches, select your nearest size (mine is 8 inches) and adjust the quantities accordingly, ensuring that you completely crowd the pan with apples. Don’t be afraid to rearrange the apples as you go to ensure they cook evenly (my burner cooks hotter on one side, so this was essential for me). The other trick is to keep basting the apples in the syrupy caramel the whole time they cook. I promise it will be worth it. Final tip: Do not under any circumstances touch the caramel. It’s much hotter than it appears! I’m so happy you loved the tarte tatin and a very happy birthday to your mom! Thanks so much for taking time to comment, and may many more delicious desserts come your way. This is one of our favorites too!